Today is Operation Write Home's 2013 Birthday Bash and we, the Perfect Paper Crafting Brand Ambassadors, are helping them celebrate in style with a fabulous blog hop! This is truly an amazing opportunity for us to give back to the men and women of our Armed Forces. If you're hopping along with us then you should have arrived here from Allison's blog. If you just happened to stop by my blog today and would like to start the OWH hop from the beginning then go to Stars & Stamps. 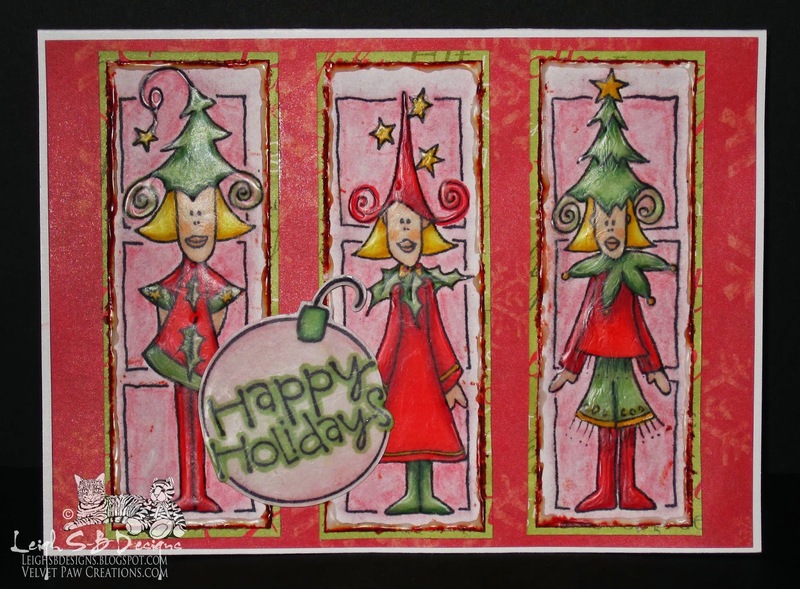 I created two Christmas themed cards based on two OWH's sketches and used my Perfect Square and Perfect Layers tools to create all the wonderful mat layering. The next stop on the hop is Patti's blog. ...blogger is being buggy and isn't publishing the hyper link properly so if it stops working again here's the whole link to use. A complete link list of all the blogs is below too! There's a $50 gift certificate from Perfect Paper Crafting for one lucky person who leaves a comment on all the blogs and PPC will accept comments until Sunday, September 29! If you would like to get involved in helping our heroes stay in touch with their loved omes then here's some helpful links to use! Thanks for hopping with us and have a fabulous day! 17. Leigh - YOU ARE HERE! Cute as can be! What a jolly, fun snowman!!! Thanks for sharing - it's been fun skipping with you today! What wonderful elves. Great coloring and love the happy snowman also. I love your elves card! The images just invoke a smile. Oh my goodness what adorable cards. I love them both, you have incredible talent. Thanks for participating in the blog and supporting OWH. Wow, such professional, boutique looking cards, love all those special extras you put into each card, great embellishment without bulk! Lots of TLC put into each one, TFS! Great cards, Leigh! I just love that excited snowman! Thanks so much for participating in our skip today and for your support of OWH! Fun cards with well done matting. The entire blog was terrific showcasing how to turn out beautiful mats with outstanding tools. You've showcased these images perfectly! Love those elves! Oh my gosh those elves are fabulous! What fun images and so nicely colored. Thanks for supporting OWH and joining in today's skip! Love Holiday cards! Great job on them. Happy to be included in the talent in this hop. Just the right amount of 'busy' ! I love the trio of elves. The layering is a great addition to the sketch. Super cute snowman. Love your cards. Love the trio of elves and the snowman. Those elves are a HOOT! Thanks for sharing! your elves are awesome! 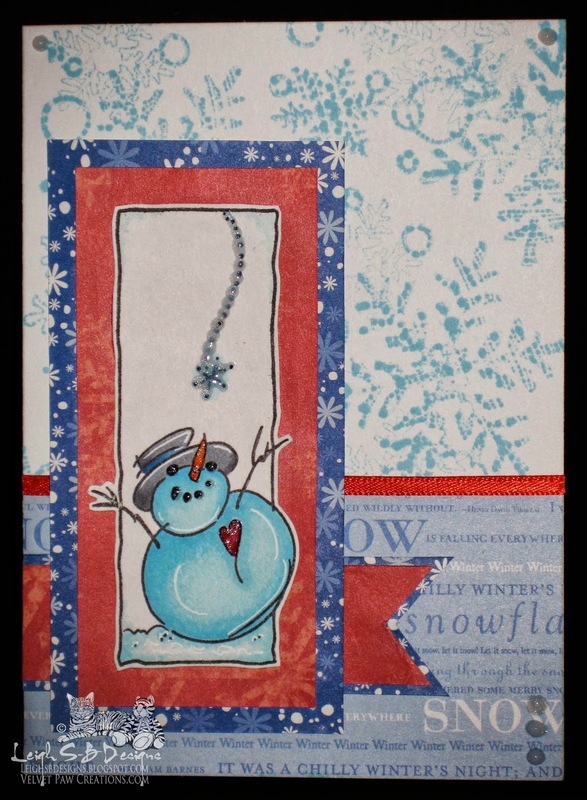 Love the layers and the happy little snowman! Both of these made me smile! Thanks for your support of OWH! Such a cute and jolly card! I've got that mat stack and haven't used it yet, so thanks for the inspiration! Cute and fun card. Love the layers with all the details. Thanks. Two really fun and different cards! Love the way you put things together, especially in the first card with the three images. Oh what fun cards! TFS! Love all the patterned paper. Great design. Love the elves and snowman cards.....so jolly! Really like the colors and elves! Snowman is fun being a little outside the box! Cute cards. The first is cute but the snowman card is so happy! Thank you for sharing! 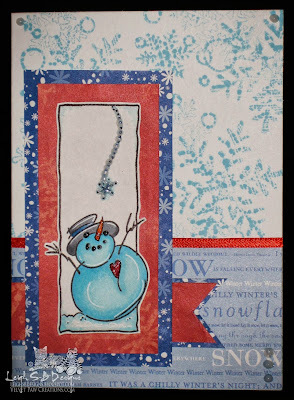 Fun Cards, I love the little Snowman.Thank you for sharing. Cute cards. Great coloring. Thanks for sharing. Fun holiday cards, I really like the lady and who wouldn't love a snowman and I have that image too. It was fun doing the blog hop with you. The red on the second card really makes the blue pop! Thanks for sharing! Love the elves! Great card! A hero's family will be thrilled with that card (and the snowman).